The manuscript, guarded from the Middle Ages in the cathedral of Santiago, remained for a year in hiding after being stolen by a former employee of the temple. The Codex Calixtinus is a XII-century manuscript jewel, considered the first and most famous guide to the Camino of Santiago. The volume was kept in the Cathedral of Santiago until 2011- the year in which it was stolen from the temple by a former employee, who kept it hidden until police found it 12 months later- it consists of sermons, hymns, miracles, liturgical texts, musicals pieces and stories about the Apostle Santiago and the pilgrimage route. That of Compostela is the oldest complete copy of the work known as Liber Sancti Jacobi, of which there are about 200 copies distributed throughout Europe. 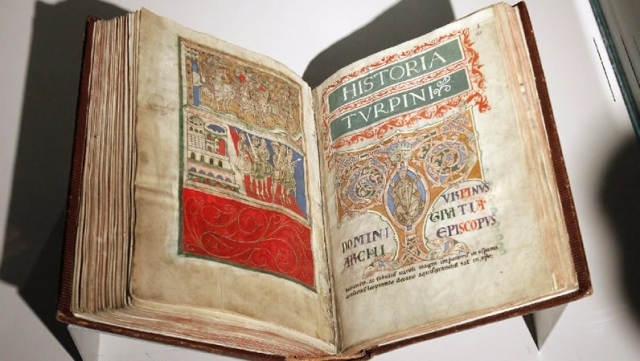 The texts were written at different times and independently, but the authorship of the last of the books that completes the Codex Calixtinus and, which specifically refers to the Camino of Santiago, was attributed to the French monk Aymeric Picaud. The 225 scrolls that make up the Codex Calixtinus are divided into five books and two appendices. The first book is about Catholic liturgies, the second and third include – The Book of Miracles and The transfer of the Apostles Corps to Compostela, the fourth is on the achievements of the French king Charlemagne, and the last, the Liber Peregrinationis, is a comprehensive guide for pilgrims who embark on the Jacobean route to the Galician capital. The Codex Calixtinus opens with two pages in which the Pope Calixto II recounts, through a letter addressed to “the very holy assembly of the basilica of Cluny ‘and’ to Diego Gelmírez, archbishop of Compostela”, his collection of testimonies relate to the miracles of the Apostle James – “travelling through the cruel lands and provinces for 14 years”-. The letter includes details on how the manuscript survived through different hazards. Continuing, the Codex Calixtinus gives way to Book I, a collection of liturgical texts regarding the religious celebrations in Santiago including most of the medieval manuscript, particularly relevant after its theft from Cathedral in July 2011 and recovery exactly a year later. It continues to the book of miracles, the story of 22 miracles attributed to St. James. It is not until the third book when an introduction to the tradition of the pilgrimage begins with the story of the evangelization of the apostle and the transfer of his body to Galicia. Book IV deals with the appearance of Santiago to Charlemagne, detailing over 28 pages, the entry of the King to the peninsula, the defeat of Roncesvalles and the death of Roland. Legend has it that James appeared to Charlemagne in a dream to persuade him to release his tomb from the Muslims. To help him the apostle guided him to the location, through a path of stars. Closing the Codex Calixtino is the fifth book, the most famous, translated and praised of the entire volume. This is an extensive and comprehensive guide for pilgrims and describes the French Way, the enclaves, the customs of the towns and cities through which the itinerary passes and shrines that Walker should not miss. It also includes a series of practical tips for the traveller and warnings about the dangers they might encounter on their adventure to Compostela. Over 11 chapters, the Iter pro peregrinis ad Compostellam it reviews the days journeys, hospices, natural accidents that cross the route, the saints who’ rest ‘ in it, the city of Santiago of Compostela, the Cathedral, the grave, other churches in the capital of Galicia, and indications on how to accommodate the pilgrims. But also the author of the manuscript recounts on the pages, anecdotes from along the route and his different views on what he encountered along the way. Notable among these reflections for his impression of the inhabitants of northern Spain, he describes them as ” fierce -faced men who terrorize people with their barbarian tongues.” “The Basque people and those from Navarre are described as being full of evil, dark in complexion, of aberrant appearance, wicked, treacherous, disloyal and false.” Also he accused them of being thieves and murderers who ” eat, drink and dress like pigs” and in particular, complains about the food, he encourages readers not try ” the fish that the vulgar call catfish,” because according to the friar, those who ingest it runs the risk of “Being sick”. The five books are complemented by an appendix that includes a repertoire of liturgical songs for big ceremonies in commemoration of St. James, 21 polyphonic compositions, which from a musical point of view are the most important part of the manuscript. After being safeguarded for centuries in the Cathedral, the Church was at the point of losing this precious relic forever. On the 7th of July in 2011 ​​the news announced the disappearance of the Codex Calixtinus. Two days before the archivists of the Cathedral of Santiago, alarmed, began to miss the book and alerted the authorities of the theft. They had to wait a whole year to recover it. On July 4th, the medieval jewel was returned to the temple and bibliographers of Compostela breathed a sigh of relief. The theft of the Codex from the shielded chamber in the cathedral which houses the most valuable works of the archive, kept society and the police in suspense for twelve long months. Finally, research led agents to a garage in the town of Milladoiro (a town in the council of Ames, bordering Santiago) to a property owned by a former employee of the temple, a native of Compostela and electrician that had in his power, not only the manuscript but also other objects of great value, for years, had been stealing bit by bit from the sanctuary of the apostle and also had a sum of money amounting to more than one million euros. The rigorous security system that protected the Codex was violated by the careless protection of the safe keys, placed in the lock, without any supervision. During the first hours of uncertainty all pointed to two possible motives that could explain the disappearance of Calixtinus: Internal revenge, directed mainly at the dean of the cathedral and thus head of the archive, José María Díaz, or a robbery performed by any art collector. Some experts valued the codex to 10,000,000 euros and the famous art thief Erik el Belga explained that an operation could have been responsible for 150,000 euros, but without collaboration from inside, it was impossible to carry out successfully. The police, with the help of specialists from the Cultural Heritage Brigade, plunged into a detailed study of almost 400 hours of CCTV from the 25 cameras that the cathedral had installed inside at the time of the robbery. With an added problem: in the room where they kept the manuscript there were no cameras, the closest ones were located in the access corridors. The operation included roadblocks undertaken by members of the Guardia Civil and the Guardia Nacional Republicana in Portugal. After a month following the robbery, police maintained all lines of investigation open, there were theories regarding larceny theft, and even a kidnapping, taking advantage, according to researchers, of the busy movement inside the temple and the lack control over access to the interior and backpacks. During these days, the Archbishop of Santiago asked the thieves to return the Codex and the government ruled out offering a reward for its return. Three months later, the dean resigned as archivist of the cathedral, recognizing that the disappearance of the Codex was critical in his decision and, by all accounts, the keys to the box in which the book was preserved along with other documents were left in the lock. On the 4th of July in 2012, the manuscript appeared wrapped in a plastic bag in a garage in Milladoiro. Pending the conclusion of the trial, the prosecutor asked for the thief to confess for stealing Codex, Manuel Fernández Castiñeiras was sentenced to a total of fifteen years in prison, half of what the Church asked, given that he was accused of stealing over a long period of time, between August 2000 until the first half of 2012, claims suggest that items taken from the safe would equate to 2,546,679 euros. After its recovery, the Codex was returned to the Cathedral, but not for long. The absence of the manuscript gave way to an unusual curiosity about this medieval jewel and demands were made for a need to publicize its story and show it to all those so they could behold it with their own eyes. Thus, the council of Galicia organised a travelling educational exhibition on the history and contents of the Calixtinus, the cultural environment in which it was written, the mentality of that time, the cathedral and the city of Santiago in the twelfth century and a summary of the story of the Camino of Santiago and its cultural values. Meanwhile, the original, which for a time was exposed in the temple of Compostela, was subsequently transferred to the City of Culture. It is now back in the Cathedral of Santiago and, remains under new strengthened security measures.